Honoring First Communicants ~ As we commemorate the Feast of the Most Holy Body and Blood of Christ (Corpus Christi) this Sunday, we also acknowledge our children, Charlotte Sperandeo and Simon Kresse who recently received their First Holy Communion. We pray that God will continue to guide and inspire them to grow in his love and wisdom. Anointing of the Sick This Sunday ~ Our monthly communal anointing of the sick and well-aging will take place on Sunday, June 18, immediately after Mass and continue on the third Sunday of each month. Please feel free to invite those who are chronically ill or facing surgery and who would like to be anointed. Our Bible Study group will meet on Monday evening, June 19, at 7pm in St. Charles Hall. Please read from the booklet, Genesis 1-11, God Makes a Start (pages 38-49) on the topic of Distrust, Disobedience and Dismay. Copies may be obtained from Father Victor. Make sure to bring your Bible and copy of Agape: A Guide for the Study of Sacred Scripture. For more information, contact Althea Porter at 716-316-8395. Parish Council Meets Wednesday ~ Our final regularly scheduled meeting until September will take place on Wednesday, June 21, at 7pm in St. Charles Hall. Council members are reminded that we have several important agenda items to resolve, so please make every effort to attend. New Food Pantry Hours ~ Luis Clay has announced a new operating schedule for the Helping Hands Food Pantry, effective immediately. It will now be open on Saturdays only from Noon to 4pm. 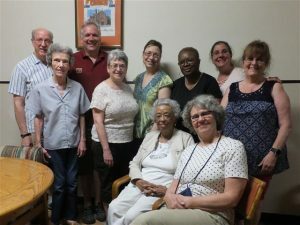 Members of the Choir concluded their final rehearsal until September with an ice cream social on June 13. Choir Vacation ~ The Feast of Corpus Christi marks the traditional end of the choir season. As they begin their summer break, we thank the members of the choir for their dedication and for enhancing our liturgies with song. We also express our appreciation for Elizabeth Clay, who will continue providing our instrumental music and leading us in song throughout the summer months. The choir will return to their official duties in September. Vocation View ~ Most Holy Body and Blood of Christ: Jesus has given us His Body to eat and His Blood to drink so as to nourish us on our journey as his disciples. God has called some to share this very gift of him-or-herself in a profound way. If God is calling you to a Church vocation, call Fr. Andrew Lauricella at 716-847-5535. You can also check out the “Priest of the Month” stories on our website www.buffalovocations.org. Trinity Festival Weekend – Many heartfelt thanks go out to everyone who volunteered in making last weekend’s celebration of our parish feast day so memorable, especially the people who were here all three days helping with whatever needed to be done. We know that Friday’s recital, Saturday’s church tours, and Sunday’s Liturgy each attracted people who were visiting our church and experiencing our hospitality for the first time. We thank each of you who introduced someone to our parish and welcomed guests at our fellowship events. Let us each make this a habit going forward to Trinity Sunday 2018. The Ladies Sodality held their annual June dinner on Wednesday evening , June 14, in St. Charles Hall. Members and friends enjoyed a Flag Day-themed holiday picnic supper prepared by Carmen’s Catering, with all-American apple pie for dessert. The program included a presentation by Father Victor honoring the one-hundredth anniversary of the apparitions of Our Lady of Fatima. Sodality President Vera Andrew presented Father with the organization’s gift to the parish of $1,000 to be used in the ongoing beautification of the church’s outdoor Marian Shine. Ms. Andrew closed the evening with a reading of Sojourner Truth’s 1851 “Ain’t I a Woman?” speech containing a message that still resonates today. Congratulations to all our graduates! As you move to the next chapter of your journey — from grade school, high school, college — we wish you continued success along with experiences and challenges that will enrich you and prepare you for the future. 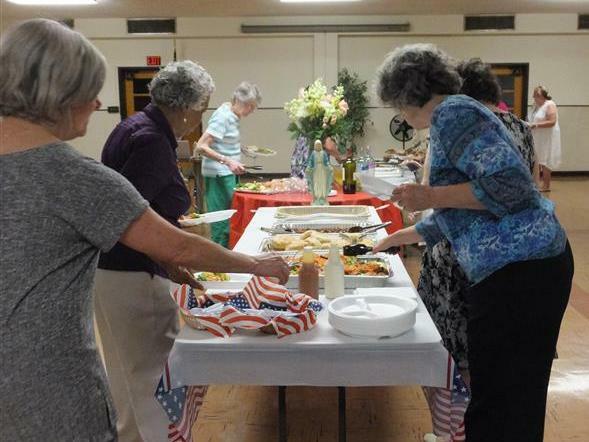 Sodality members and guests enjoy Flag Day picnic supper on June 14.